New Bigger Bottle. Travel no further...for those seeking velvety shine and ultimate control. Lock out humidity and frizz. 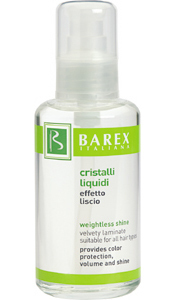 Barex Cristalli Liquidi has porosity control with added volume. Always the first step for professionals as a cutting tool. Contains sun filters, for all hair types.Apply to wet hair, comb through and style to your heart’s content.